OK, sure. It’s six miles long and a darn good workout. But I’d be hard pressed to come up with a hike that I like much better! It has a hidden forest, rugged mountains, high vista scenery and low desert exploration, all rolled up into a gorgeous half-day adventure. 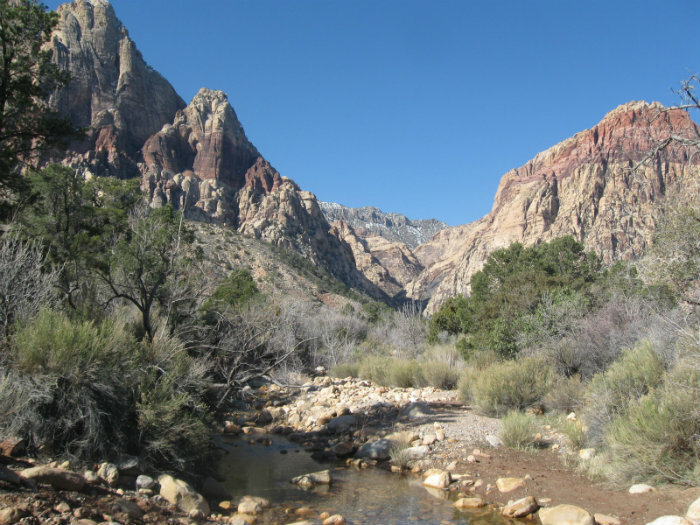 Simply put, it’s everything that you want in a Red Rock hike. The trail can be accessed from three parking areas: Upper White Rock Springs, Lost Creek and Willow Springs. Remember, this is a big loop so the parking decision isn’t as critical as say, Potato Knoll. However, I would recommend starting around mid-morning from the White Rock Springs parking lot. That way you won’t be hiking into the sun all day, and you can lunch at the Willow Springs picnic area. The Upper White Rock Springs parking area is located about six miles around the scenic loop drive, just past the High Point Overlook. You’ll need to follow a rocky dirt road for the better part of a mile to get to the trailhead. Be sure to take some snacks and ample water. Two of those sports-sized bottles per person should be about right. Lock up your car, use the restroom and do some nice long stretches. Apply a glob of sunscreen, put on your big floppy hiking hat and you’re ready to go! From the parking lot you can flip a coin to decide which way to hike, clockwise or counter-clockwise. My coin toss always comes up clockwise, so we’ll set off to the west, through the split-rail fence and downhill along a bumpy old jeep road toward Willow Springs. You’ll quickly come to a trail sign that offers a nice side trip down to the “Guzzler,” a man made water catchment that is a pretty spot for a picnic (I’m always thinking about food) but it will add another mile, so keep that in mind! The old road continues west along the foothills of White Rock Mountain, eventually turning into a footpath and leading down through a colorful wash and then climbing up again to an area still scarred from an old fire. After a modest hill-climb, you’ll be back on top, with a nice view of the Calico Hills and Las Vegas in the distance. As you approach Lost Creek the trail narrows and leads through a dark red Chinle formation. Here you’ll see some huge barrel cactus and even a few sandstone boulders dappled with red spots. These spots are iron concretions. The sandstone eventually erodes from the harder iron-rich spots, dropping little round stones, which strongly resemble marbles. It can take hundreds of years to make a marble, so remember to take only pictures! The path continues past an ancient roasting pit, a pictograph site and into the Willow Springs picnic area. After a relaxing stop in Willow Springs, continue hiking up the old Rocky Gap road until you reach a sign directing you north toward La Madre Springs. Keep a sharp lookout for bighorn sheep, as this is one of the best places at Red Rock to see them. Here, you can raise your water bottles in celebration because you’ve made it halfway around the loop! The scenery changes dramatically now as you approach the north side of White Rock Mountain. You’ll leave the desert and enter a forest of juniper and pine trees, completely hidden from anyone but hikers. This “back-side” trail is one of my favorite places at Red Rock. It’s a secluded, green forest quietly resting under the magnificent craggy north side of White Rock. I am always amazed at the difference between the north and south faces of this mountain. Now would be a good time to slow down to a stroll, letting your senses dance along with the breeze, and softly connect with this ancient forest. You’ll come to a little sign marking the trail to La Madre Springs. That’s another good trek, but probably too much to include as part of your loop hike today. Turn south instead and follow the path through the trees toward the mountain. The trail climbs gradually out of the forest and eventually leads to a high “saddle” to the east. From this ridge you’ll have an amazing view of the hidden forest and North Peak to the west, the sweeping face of the La Madre range to the north, Turtlehead Peak and the Calicos to the east. (By the way, this saddle is another legendary picnic spot.) From here it’s all downhill as the trail comes around the east side of the mountain and down through a broad gravel wash, eventually leading to the Upper White Rock Springs parking lot, and your car! The White Rock Loop Trail is wonderfully scenic and diverse. There’s enough of an elevation gain to make it interesting and the length is perfect for a day hike. The only flaw being that almost half of this trail follows old roads, which are rocky and distracting. The loop loses a point for the roads but still rates an easy eight boots out of ten. The SMYC Trail is the first of three legs that make up the ten-mile Escarpment Base Trail. 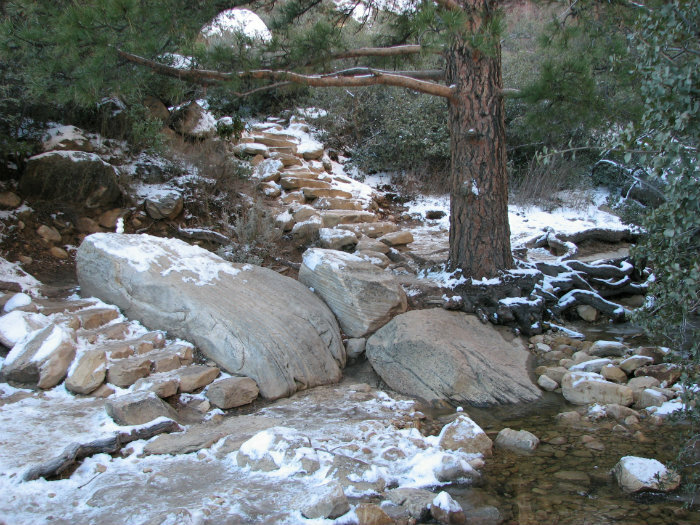 This short path also links the Lost Creek and Ice Box Canyon trails and can be accessed from either of those parking lots. The first and most logical question that you may ask is “what does SMYC stand for?” Six Million Years Coming? Several Miles You’ll Cross? There’s no handy interpretive sign to clue you in. Seven Mules Yodeling Coherently? Well anyway, grab your hat & bottle of water, stretch out those calves and let’s see what’s out there. From the Lost Creek parking lot, follow the trail about a tenth of a mile. You’ll then see a little sign directing you south onto the SMYC trail. If you look at a trail map, the SMYC appears to be a quick little interconnecting route between two major areas of interest. There can’t be much to see on such a short trail, right? Staircases Make You Climb? Six Minute Yucca Cooking? The path starts out very pleasantly, crisscrossing Red Rock Wash with hundreds of carefully laid cobblestones, presumably done to keep the trail intact after flash flooding. Have I mentioned the staircases yet? The first of many handcrafted stone stairs are nestled here among cholla, beavertail, pincushion and strawberry hedgehog cactus. These red steps are really picturesque and just a prelude to the fantastic gardens that await you during the next mile. The trail climbs and dips and winds around dramatic mountain foothills revealing hidden vistas and surprise gardens that just spring up on you. Be sure to take a camera because you’re going to see amazing things around every turn. About midway you will have reached a high point with some unique views of Ice Box canyon. This would be a good spot to stretch out and enjoy that backpack lunch you brought along. After negotiating several sandstone staircases (say that real fast) you’ll find yourself in a vast meadow near the Ice Box Canyon trailhead. SMYC is only 1.1 miles long, but it’s a workout. And it’s just wonderful enough to make you want to turn right around and go back over it again. Well, you have to, your car’s parked back there. OK so SMYC is really 2.2 miles long. Santa’s Making Yule Crafts? Steep Menacing Yonder Cliffs? SMYC really stands for Spring Mountain Youth Camp, which is credited for the construction of this trail. If you ask me, they did a darn good job. I was simply blown away by the SMYC Trail. I guess because I expected a quick little interconnect route, and got handcrafted staircases and cobblestone paths instead. Six boots out of ten on the ole bootmeter! Ahhh… Pine Creek Canyon. This is one of the most popular places to experience the full splendor of Red Rock. The trailhead is at the ten-mile point around the scenic loop drive and features RV parking, restrooms and even some nice interpretive signs. You may need to arm-wrestle someone for a parking spot but your patience will be rewarded because Pine Creek offers something for everyone. It’s a great place to walk around a bit and take in the view, but it’s also a perfect spot for an outing with the kids, as the trail is fairly easy and even educational. Birders and naturalists will enjoy the meadow and riparian areas; hikers will love the world-class rock scrambling in the canyon, and climbers have more than enough routes to keep them busy for days. The main obstacle at Pine Creek is the rather steep descent from the parking lot down to the canyon leg of the trail. The original access route was longer and softer but a few people began shortcutting down the side of the hill and eventually created this somewhat challenging 12% grade that has now become the “official” trailhead. It doesn’t take many people cutting a trail to impact the desert permanently. See… it’s already educational! Be sure to pack some water and don’t forget your camera or sketchbook because this hike offers plenty of inspirational scenery. The first thing on your agenda should be a little side trip along the Fire Ecology Trail to learn about the desert’s natural fire recovery process. This educational trail loops back onto the main route where you continue west until you cross the intersection of Dale’s Trail. Check out the remains of the old stone gate here that used to mark the entrance to the Wilson ranch. The mountain views from this point are fantastic; Mt. Wilson to the far left, Rainbow Mountain, Rainbow Wall and Juniper Peak, Mescalito straight ahead and Bridge Mountain on the right. The towering red, black and gray mountains combined with juniper, pine and various deciduous trees create our own “color country.” In the fall when the leaves are turning this hike can become a sensory overload! The next stop along the Pine Creek Trail is a little fixer-upper opportunity called the Wilson Homestead. At first glance it seems to be a plain old foundation from a small cabin, but take the time to look a little closer and you’ll begin to experience the history of this place as you imagine the people that once lived here. You can still see traces of yellow paint on the concrete walls and bits of embedded wood from a window sash. You wonder what life must have been like for the Wilson family so long ago. Listen quietly to the singing birds overhead, water bubbling peacefully in the creek below, and wind softly blowing through the canyon, rustling the leaves of the trees. There are spirits here, and they’ll tell you their story if you take the time to listen. From the cabin, the trail continues across the meadow toward Pine Creek. Look closely at the well-traveled dirt path and among the boot tracks and dog prints you’ll see evidence of the nighttime visitors as well. Deer, coyotes, burros and other critters all leave their prints in the meadow. You can hike a one-mile loop trail from here by crossing the creek and making a right turn. The path can be a little tough to follow so pay attention to the route and try not to make any new short cuts. The loop is a bit more challenging than the main trail, but you’ll be rewarded with deep canyon scenery, lichen-covered boulders and magnificent Ponderosa pine trees. As you drop down into the wash you can pick your way across the rocks to stay on the loop and return to the meadow, or you can venture further into the canyon along the wash toward Mescalito Peak. The south fork will take you into an area called “The Terraces” and the north route leads into “Fern Canyon” and the famous “Dark Shadows” climbing wall. Be forewarned, however, that these hikes are R-rated and not suitable for all audiences. Pine Creek Canyon is vastly popular for it’s variety and accessibility. The overall experience scores high on my 1 to 10 rating system, but loses a few points for the steep access trail, crowds of people and noisy rock climbers. Even with those distractions Pine Creek Canyon scores a solid seven boots! Bouldering is the fine art of leaping gazelle-like from the top of one boulder to the top of another, to another, in rapid succession without permanently damaging yourself. This back-wrenching activity is serious fun and an old guy like me has no business doing it. But we happen to live next to one of the best bouldering areas in the world, and every once in a while I just have to venture out to Oak Creek Canyon and give it a try. There are two ways to find this beautiful canyon nestled between Mt. Wilson and Rainbow Peak. The shortest route is from the north and can be found by driving twelve miles around the Scenic Drive, then following dusty Oak Creek Canyon road to the parking lot. The mile-long access trail (actually an old road) runs straight as an arrow due west, is and very rocky. If you choose to go this way, try not to twist your ankle early on, there’s plenty of opportunity for that later. The South Oak Creek Canyon route is longer, but somewhat more interesting, and it’s the way I chose to go for this article. To get there, follow highway 159 west about four miles past the Visitor’s Center and look for the Oak Creek Canyon sign. You’ll have to park along the highway, but there is plenty of room on both sides of the road. The trail leads through an old campground to a sign that announces the “New Oak Creek Trail System.” From here, it’s a 2.5-mile walk northwest to the canyon. The first mile or so follows another old rocky road through the desert. You’ll likely be sharing this route with mountain bikes and horses, as this is a popular spot for both of those activities. In fact, the bikers have cut a little side-trail along the main road, which makes things a bit smoother going for us hikers, too. As you come around the Knoll (the little potato-shaped mountain standing alone at the foot of Mt. Wilson), the scenery changes dramatically. The open desert and noise from the highway disappear and the hard rocky road beneath your feet gives way to a soft red dirt path. You’ll find yourself now in a little forest of pine and juniper trees with Mt. Wilson towering to the west, and the Knoll beckoning with its own series of trails to the east. This would be an excellent spot for a family picnic, or to just spend the day exploring the base of Mt. Wilson, but… world-class bouldering is waiting only a short mile away! As you continue along the path toward Oak Creek Canyon, it abruptly becomes narrow and harder to follow. (Bikers and horses usually turn east here, following the red dirt path around the Knoll). Just pick your way northwest through the brush and keep heading toward the canyon. You’ll soon discover how this canyon got its name; there are desert oak trees everywhere! Obviously, there’s year-round water down there somewhere, but it’s hard to see through all the growth. The trail continues along the south canyon rim making its way around some big boulders and slowly dropping downward, where it roughly intersects with the trail from the north parking area. This is a gorgeous, almost secret area hidden between two magnificent mountains, but it can be a little challenging to get down here. Except for the native blue jays, songbirds, butterflies and other critters that call this canyon home, you’ll probably have the whole place to yourself. Standing on the bottom of Oak Creek Canyon, you’ll see that this entire wash is a series of huge sandstone boulders. Big, colorful, round and just waiting for you to try out your rock hopping chops. You can follow the canyon west for another mile or so, but only by bouldering (or by helicopter… that’s how Search & Rescue will get you out). Keep in mind that this is a wash and if it looks like it might rain, stay out of here! I’m always amazed at how unique each of the Red Rock canyons are, and Oak Creek is no exception. 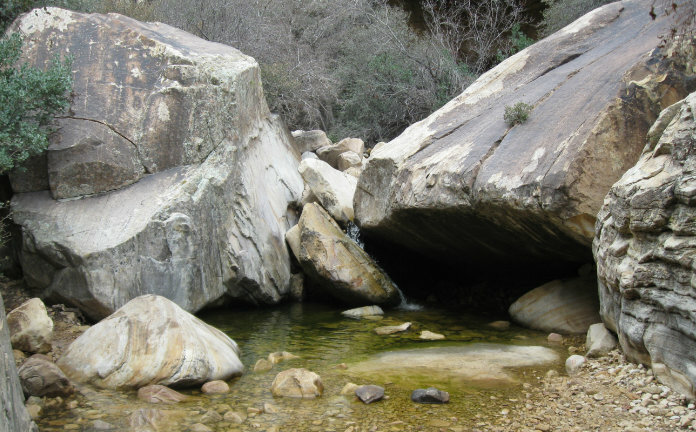 While being somewhat less accessible than the other canyons, Oak Creek offers great beauty and satisfaction for those of us who must have a little rock scrambling in their lives. So, grab your water bottles, lace up those high-top ankle-supporting boots and make some tracks of your own into Oak Creek Canyon. The bouldering alone would score nine boots out of ten, but the mile-long, rocky access roads and braided canyon trails only earn five, so the overall hiking experience averages a respectable seven boots. Hey, as soon as my ankles heal, I’m going back! 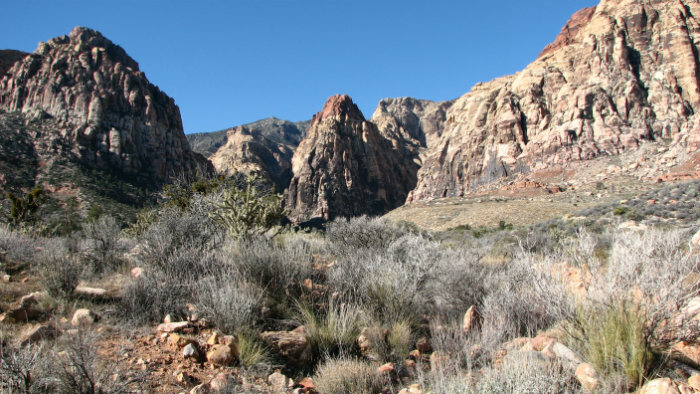 If you’re an early riser, there’s a treat waiting for you at Red Rock Canyon called the Moenkopi Loop Trail. This easy two-mile walk is perfect for anyone who is hungry for a quick taste of desert life; but if you can get up coffee-early and make it out here by six in the morning, there is a special magic that you just can’t experience at any other time. The soft light caresses the Wilson Cliffs revealing all the color and drama of the escarpment. The air is cool and sweetly scented. It’s quiet… still… Here at last is a place where you can start the day in peace, reflect on life, commune with the desert and all of its rich history and still make it to work by 8 o’clock! If you prefer a more social experience, the Interpretive Association offers the popular “Moenkopi Morning” hikes first thing every Wednesday. Moenkopi is a Hopi word that means “place of running water”, but I recommend that you pack a bottle of H2O anyway, just in case. The trailhead is near the visitor’s center, at the southwest corner of the tortoise habitat. The path is well marked and features several interpretive signs as you wind through the desert among the yuccas and creosote, black brush and desert trumpets. There are a couple of forks in the road that lead north to the Calicos and even link to the eleven-mile Grand Circle Adventure, but just follow the signs and stay on the Moenkopi trail to enjoy terrific views of the famous Calico Hills from this unique vantage point. As you begin the gentle ascent up the hill, the cement-like caliche in the path gives way to gray limestone, which forms terraces with little cactus gardens growing between the rocks. A 230-million-year-old seabed forms the top of the hill. Look closely and you can find fossils of seashells and plants! There are some nice barrel cactus growing up here, a few strawberry hedgehogs and not one, but several pincushion cacti growing among the limestone! 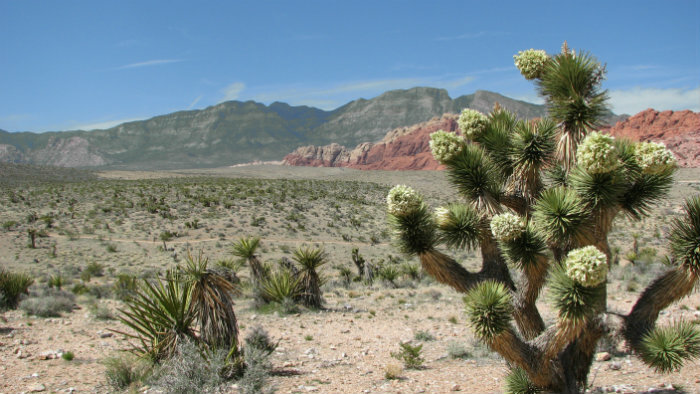 This is probably the best place in Red Rock to see this elusive little cactus. A wooden bench marks the halfway point on the Moenkopi trail, and is a great place to sit for a while and take in the view. At 100 feet above the visitors center and roughly centered in the park, this spot serves up a really rich 360-degree view of Red Rock Canyon! The trail continues down the backside of the hill along a sloping shelf of limestone (this might be a likely “place of running water” during a rainstorm), then eventually deposits you onto an old caliche and gravel service road for the remaining half-mile walk back to the visitors center. The Moenkopi Loop Trail is a dish best served in the morning. It gains a full point for the pincushions, but loses half a point for the rather boring return along the old road. On my one-to-ten rating system, the Moenkopi Loop Trail earns four-and-a-half boots, which is pretty good for a one-hour “Taste of Red Rock” experience! One of the roads less traveled at Red Rock is the La Madre Springs trail. To get there, park your car at the Willow Springs picnic area near the old Rocky Gap road. Lace up your boots nice-n-tight and grab lots of water. This would be a good time to do some slow stretches to loosen up those leg muscles, too. If you have an off-road vehicle it is possible to drive another half-mile or so up to the trailhead. It’s slow going over some pretty rocky terrain, but this is the only place in Red Rock that you’re allowed to use that SUV, so go ahead. Whether you drive or walk up Rocky Gap, be sure to stop and read about the huge Agave Roasting Pit located on the south side of the road. From the trailhead you’ll hike up a long 10% grade as you wind around the backside of White Rock Mountain. Some relief comes about halfway up to the springs when the trail levels out and you find yourself in a park-like setting with a nice, soft, tree-lined path. At this junction of the White Rock Loop & La Madre Springs trails there are two flat-topped “sittin” rocks. Pull up a boulder and rest here for a while. This is actually the prettiest point on the hike and some of the best scenery that you’ll find anywhere at Red Rock, and you’ll likely have it all to yourself! From here you are totally surrounded by mountains. The limestone La Madre range (“The Mother” in Spanish) is right behind you; North Peak and Bridge Mountain are to the West and directly in front is the big dog himself, White Rock: a magnificent three-headed mountain with its impressive alluvial fan spread out at your feet. Believe me, driving by on the scenic loop you just have no clue that White Rock Mountain is this majestic. Continuing up the trail toward the La Madre Spring you’ll come across two old concrete pads. These are the remnants of the Las Vegas Archery Club that closed in 1975 when the BLM acquired this land for an expansion of Red Rock Canyon NCA. From here it’s a short walk up the road to the springs. A little dam was built here in 1968 creating a nice pond and one of the biggest riparian areas at Red Rock. There are plants and birds and bugs of every description here, and of course this is a popular year-round watering hole for the bighorn sheep, mule deer and other mountain critters. The pond marks the official end of the trail. The path, however, continues through the wetland and up the ravine into the La Madre Mountains. If you choose to explore beyond this point, be sure to wear long pants for protection from the overgrown plants, bugs and assorted no-see-ums. 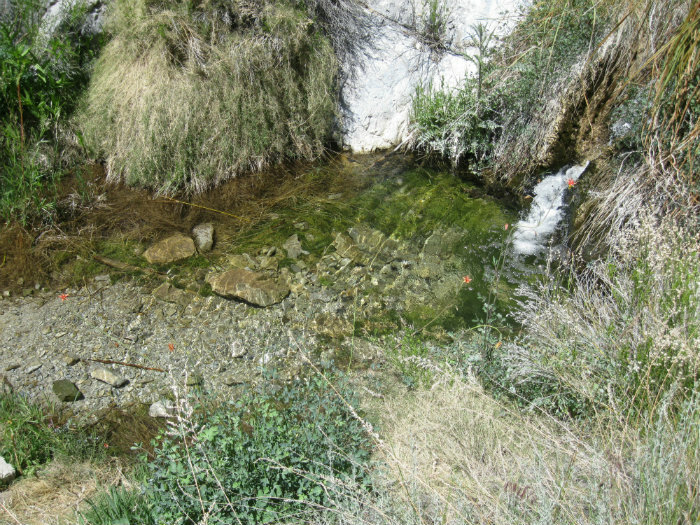 Your efforts will be rewarded with several small waterfalls and pools as you follow the spring. There’s even an old rock miner’s shelter up here that makes a good spot for a backpack lunch. Overall, this old jeep trail is a good aerobic workout with a lot of interesting cultural resources to see along the way. The “backside” view of White Rock Mountain is awesome and earns the La Madre Springs trail six out of ten boots! During the winter months when the days are short, it’s nice to have a few small hikes available that can be enjoyed in just a couple of hours. One of these is the Keystone Thrust Trail. It’s easily accessible, packed with interesting history and a pretty good workout, too! To find this trail, drive about six miles around the scenic loop until you see a sign announcing White Rock. From here, a rocky dirt road leads north another mile to a fenced parking area that serves the White Rock and Keystone Thrust trails. This will be at least a three-mile hike, depending on the return route that you decide to take, so don’t forget to pack a bottle of water for each person. Even in these cooler winter months it’s important to stay hydrated while you’re in the desert. At the north end of the parking lot you’ll find an interpretive sign briefly explaining the Keystone Thrust trail. As it turns out, this is a unique and important area for geologists, and they come from all over the world to study this thrust fault. You’ll discover why as we get a little farther up the trail. Follow the rock-lined path north across the wash until you come to a sign directing you up a picturesque little hill with railroad-tie steps. At the top of the hill the trail intersects an old road. Turn left and follow the road around Hogback Ridge and toward the La Madre Mountains. Legend has it; in the early days of Las Vegas this remote desert road was a popular place for stolen cars to be stripped. Those old vehicles were removed long ago, but if you look carefully you may be able to spot some small metal parts slowly rusting away among the rocks and shrubs. Once you’ve passed Hogback Ridge you’ll come to another sign directing you toward the Keystone Thrust. This is the highest point of the trail and the views are really nice with Turtlehead Peak and the Calicos to the east, the La Madre Mountains to the north, and White Rock Mountain to the west. 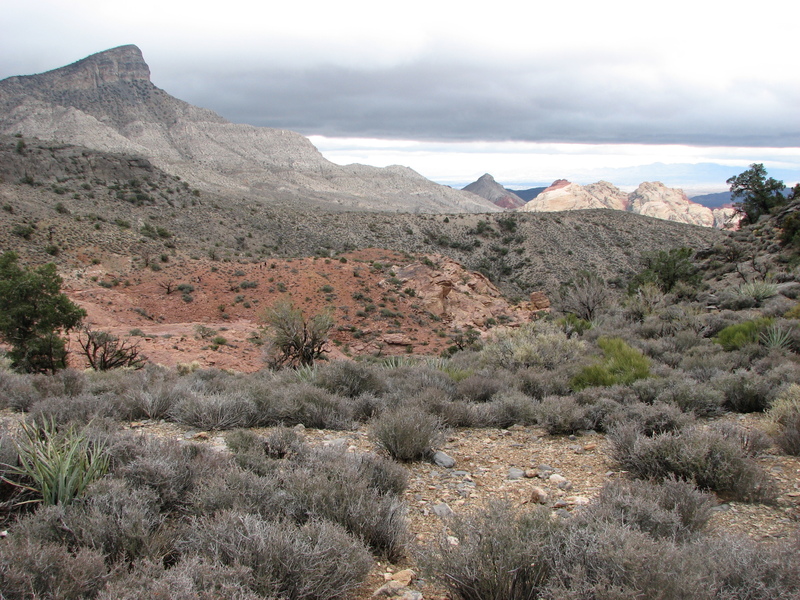 The trail now leaves the old road, turns sharply east and descends into a wide red and gray canyon. This is what the geologists go bonkers over. Two exposed tectonic plates! These are gigantic slabs of the earth’s crust that move around to create earthquakes, mountains and continents. It’s actually possible to stand with a foot on each plate. Keystone Thrust Fault is one of the only places on earth where this can be done! Normally, this kind of exciting rock action is taking place miles underground. Even for the non-geologist, it’s interesting to see the red sandstone on the west side of the canyon smashing into the grey limestone on the east side forming new mountains before our very eyes. Try to think in rock-years to get the big picture. For most people, this is the grand finale. Time to turn around, hike back the way you came in and call it a day. But as a Boot Tracks reader, you’ll want to know that there are some hidden treasures to be found just a little farther south and deeper into the canyon. The rocks become very dramatic and in the winter you’ll find pools of water reflecting the sky and trees. The jagged east side of the Hogback looms darkly overhead. Pick your way around a high waterfall area and carefully follow the canyon through dense shrubs and colorful boulders until the canyon slowly gives way to the open desert. The wash eventually leads back to the scenic loop drive, depositing you about a mile east of the White Rock turnoff. If you decide to take this route, please stay in the wash and avoid shortcutting across the desert to your car. This is sensitive ground with areas of active cryptobiotic (living) soils. Use your tread lightly skills and be sure to leave no trace! The three-mile round trip to the Keystone Thrust is a fun outing and a good workout with a major educational bonus at the end. It deserves six boots all on its own, but if you have the extra time and inclination, exploring the canyon a little deeper “thrusts” the overall rating to seven boots! Last month, I left you stranded about six miles out, halfway around the Grand Circle Adventure in the White Rock parking lot. I know it’s been a long wait and I hope that you didn’t run out of food, but with this edition of Boot Tracks I can now tell you how to get back to the Red Rock Canyon visitor’s center. Hopefully, you’ve got about a half-gallon of water left over from part one of this little trek, so slap on a fresh coat of sunscreen, grab your hat and let’s go! We’ll begin by hiking south a half-mile along the gravel road that leads from the parking lot toward the scenic loop drive. If the careening, gravel-spitting SUV’s on this road don’t scare you, then the evil scenic drive crossing is waiting just ahead. You may recall my warning last month about the kamikaze drivers on this road. You’re not paranoid; they really are out to get you, so please be careful. Once you get across the road you’ll quickly leave civilization behind as the trail drops down into a surprisingly tranquil desert meadow with several varieties of flowers and cacti. This portion of the trail is lightly traveled so you’ll find that it’s quite natural and undisturbed for the next couple of miles. The path takes you over several hills and valleys in miniature basin-and-range topography. It’s interesting to see how everything adapts to its environment from the tops of these ridges to the lush washes below. Except for one more hair-raising scenic loop crossing, it’s pretty nice out here, and chances are good that you’ll have this portion of the trail all to yourself. As you approach the Sandstone quarry area from the west, look for the soil to suddenly turn dark grey. This is a clue that the area was once an agave roasting pit. For some reason there are several trails at Red Rock that bisect these ancient cultural sites, so when you cross one please tread lightly to preserve what’s left of these irreplaceable historical records. Once you arrive at Sandstone Quarry you’ll probably be overrun by crowds of people and a seeming crush of humanity that will completely shatter the serenity of the previous hour’s hike. But, this is a popular recreation area, so try to enjoy the good vibes from all the happy people while you rest your legs for a while. The trail picks up again near the entrance to the Sandstone Quarry parking lot and leads you east along the edge of the Calicos. The up close and personal view of these red sandstone mountains is really impressive, and at certain times of the year you’ll even see several small tenajas, or natural water tanks that have formed in the rocks holding their precious cache of rainwater. If you enjoy petroglyphs, Calico II features a table-sized stone literally covered with the ancient rock art. As pretty as the calicos are from the scenic drive, it just doesn’t compare to the rich experience of hiking down in the canyon, right next to them. Between the Calico II and Calico I parking areas, the trail becomes a little braided and difficult to follow. You’ll need to use your best route-finding skills to find your way through the rocks and to stay on the proper trail. Once you climb out of the canyon and up to the Calico I parking lot you’ll have a choice of routes for that last mile back to the visitor’s center. You can follow the “official” trail to the east, or cross the scenic loop drive and take the somewhat nicer Calico I trail toward Moenkopi and then back to the visitor’s center. Either way the distance is about the same and frankly by now your legs won’t care. By this time they’ll just want to go for a long soak in the nearest bubbling hot tub. So, you’ve done it! 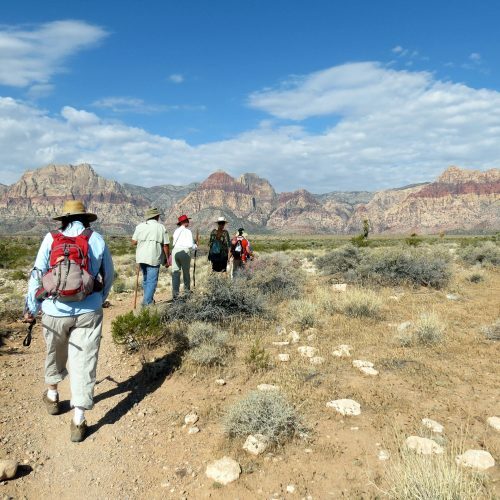 In one outing, you’ve experienced more of Red Rock canyon’s diversity than most visitors can even imagine. You can be very proud of yourself for accepting this personal challenge and hiking “The Big One”. It probably won’t be today, but you’ll hike this trail again. How far is eleven and a half miles? Just a spin around the Grand Circle Adventure. I give it seven out of ten boots!